New federal data takes a look at how the worst drought in a generation is hitting shoppers. Consumers can expect the worst US drought in 50 years to cast a shadow across food prices throughout 2013, according to fresh government data released today. The estimates are the first to capture the effects of this summer’s drought in America’s heartland, and show food prices increasing at a rate well above normal expectations. “We’re expecting another year of tough food prices, bad news for consumers,” said USDA food economist Richard Volpe. “The difference between normal and higher than normal in this case is one hundred percent attributable to the drought,” Volpe said. The food price index data is released by USDA each month; it is a set of numbers that indicates how much an average shopper is likely to pay at the supermarket. Normal food inflation has been between 2.5-3.5 percent in recent years, Volpe said, and is calculated to include a variety of pushes and pulls on the economy, including fuel prices and the state of the American dollar. That so-called normal inflation rate will largely play out for the rest of this year, all things being equal, he said. 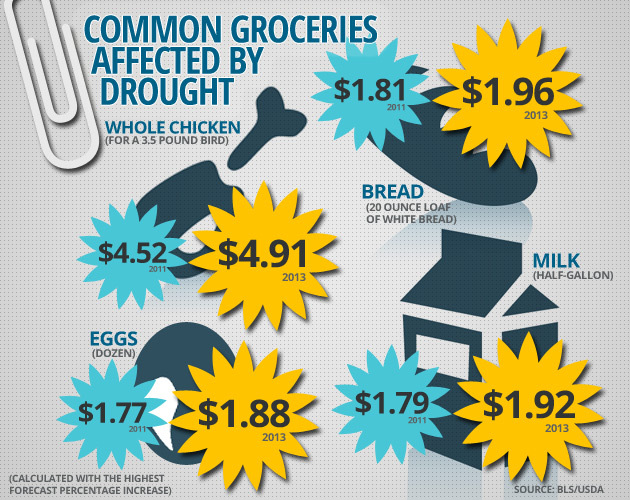 The drought will surface in food prices next year. Climate Desk has illustrated a handful of basic groceries in the graphic above, comparing the average prices for the last full year of data, 2011, with USDA’s projected prices for 2013. While price increases may not seem too severe on the surface, they add up for a family on a budget across a year. One estimate says that the US, the biggest player in the world corn market, could slash world corn supply by 60 billion tons as a result of the drought. Looking further afield, food prices in the US have a big impact not only on prices around the world, but also on the potential for social unrest in developing countries. Animal-based perishable foods will be hardest hit. The USDA projects that poultry products will rise 3-4 percent next year, compared to this year’s average. The biggest rises are seen in beef and veal, rising 4-5 percent from 2012 averages (Volpe says structural problems play a role in this sector, alongside the drought). Dairy products will take a hit too, rising up to 4.5 percent. There is a lag in food prices because it takes time for the effects of a drought to ripple across the food system. Many food manufacturers lock in long-term prices with primary producers. Consumers are likely to see price hikes once the contracts are up, said Joe Parcell, Director, Agriculture and Applied Economics at the University of Missouri-Columbia. “We’re going to start feeling the impact from September onwards,” he said. More than 60 percent of America’s farms are located in areas experiencing drought. Two thirds of all crops and two thirds of livestock are produced in areas experiencing at least moderate drought. It will take a another year before the drought has moved through the system, USDA’s Volpe said.